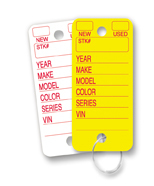 The ORIGINAL Round-Cornered Plastic Tag! 23 mil Polyethylene Printed Fire Red Ink on Yellow or White Stock Includes rings and 2 Fine Point Sharpie Pens. Size is 1-3/8" X 3”. Packaged 250 per box.